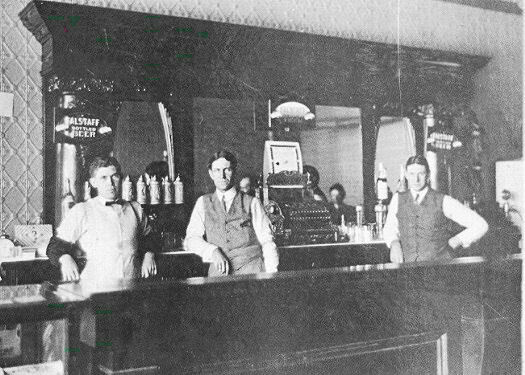 Denny and Mike O'Brian and unidentified bartender in William Finnigan's Saloon. Circa 1912. Courtesy William Finnigan collection. 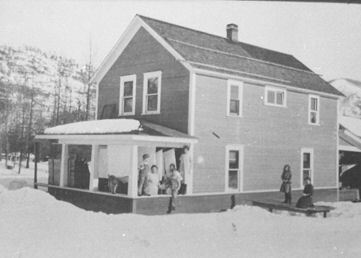 Miss Ethel Baxter moved from her parent's home on Pilgrim Creek into Noxon in 1907 to work for Mrs. Clifford Weare in the Posts and Poles Store. Clifford was spending more and more time tending to his timber business. Women's white blouses were selling for $1.98 and long silk gloves could be bought for $1 a pair. Corsets and hosiery also were available. Men's suits cost $10 in Thompson Falls, but were not available in Noxon stores. The coldest weather of the season gripped the valley for ten days during the middle of March, and the businessmen took advantage of it to lay in their supply of ice from the slough. Using ice saws, they cut blocks two feet thick. At the end of each day their muscles ached from using tongs to lift wet, slippery cakes onto sleighs; to be hauled to sawdust filled ice sheds behind the stores and saloons. Children and parents also enjoyed the last of the good skating of the winter. The annual school board election placed Sheldon S. Brown on the Board of Trustees at Noxon for a three-year term. The community continued to be proud of its school and worked together to improve it. Sanders County Commissioners granted a license to sell liquor at Noxon to William Finnegan (sic) January 5, 1907, and allotted Dr. E. A. Peek $400 per year as county health officer. ﻿﻿Finnigan's saloon had a seven-foot-tall, multi-mirrored backbar, one of the finest in the county. The false fronted frame building was conveniently situated nearly due south of the railroad depot on the north side of main street. Commodities for Finnigan's saloon in those early years of the century were shipped to Noxon by rail from the Caprice Commercial Company, Butte. Zin Coza tended bar when Bill went somewhere. 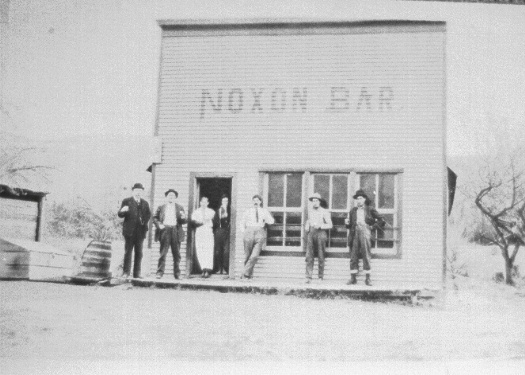 Charlie Maynard's Noxon Bar. Denny O'Brian, Sheldon S. Brown, Don Maynard, Jess Beason Bill Finnigan, Can Ryan, unidentified. Circa 1907. Courtesy William Finnigan collection. Maynard installed a lighting system in his saloon that operated from a tank filled with gas and then pumped up with air from a hand-operated pump. Hollow tubes ran around the room. Mantles made of glass filament were on the ends of the tubes. Operated like a gas lantern, care was needed to turn the gas on slowly enough not to break the mantles. It provided lights as bright as any in the valley for the patrons of the popular saloon. Jim Finnigan's home west of Noxon, circa early 1900s. Courtesy William Finnigan collection. Tough elements roamed the area frequently. Clifford Weare, the storeowner at Noxon recalled once when a couple of toughs stabbed him in 1907. "These toughguts were white kids 22 or 23 years old. George Music and George Brown. They came in my store and told everybody to get out. 'We're going to have a rough house here,' they said. And they were going to lick me. "That was kinda foolish on their part," Weare would chuckle as he related the tale. "One of them come around the front of me and the other come behind me. The one behind me had a knife and I didn't know it. But I hit the first fella and he just went down like he was beefed. And he stayed down. He never got up. But the other fella stuck a knife in my back as I was turning towards him. He just hit the shoulder so it didn't hurt me much. If he'd hit me right in the back, it'd of killed me. I went after him. And I put a head on him he could of drank out of a barrel." Sheriff Massey came on the train from Thompson Falls. Weare told him the culprits were working around Noxon for several months cutting poles and posts and for some reason had a grudge against him. He said theyd waited their opportunity and when no one was in the store Sunday, they had commenced the assault. Massey found Music but Brown had gone back to camp. He deputized Bill Anderson to get Brown. Anderson brought Brown in on Tuesday. The two were held on $250 bond and the judge bound them over on $1,500 each. After the case dragged through court for two and a half days the men were found not guilty and released.1. Clifford set tongues wagging and created a fearful row when he ran off with Ethel Baxter. After getting married in Greeley, Colorado they returned to the Posts and Poles Store at Noxon. Clifford took his small son, Neil, to live with them. Months later, his ex-wife Pearl, returned to Noxon for a time. 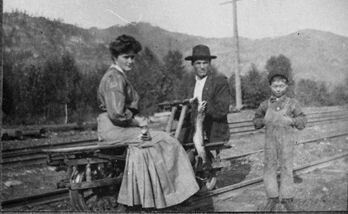 Clifford and Ethel Weare, returning on their railroad-bike after a successful fishing trip; Ethel carrying the pole while Clifford holds the char. Young Neil Weare had ridden behind Ethel, on the bike's bench-like seat. Courtesy Clayton Bauer collection. 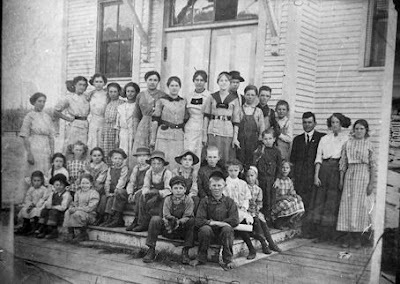 ﻿﻿The Union Sunday School was started and met at the schoolhouse, mostly at the urging of the women. Shelton S. Brown, one of the school trustees to approve the use of the building for this purpose, was nicknamed 'Sunday School' Brown by the sports in the saloons. After James Corbett's wife divorced him, James found operating the store and hotel without her too much of a burden, so in January, 1908 he sold out to the McNall brothers, Lee and Filo, of Sprague, WA.2. They took possession on a Tuesday and put in a large stock of groceries, held a dance in their hotel and hired Mrs. Albert Fuller as cook in their hotel dining room. Teaming up with Weare and the Finnigan brothers, McNall's cut ice and fill their icehouses from the frozen slough. Hay ran out in mid-winter, so Anderson and 'Sunday School' Brown had a carload of hay shipped in from Wicksville for their cattle. Edward Bauers put a cobbler shop in McNall's store, prepared to do all kinds of fancy shoe repairing and Filo McNall became the postmaster. Three weeks later McNall' were erecting a new building.3. This early expansion encouraged the Finnigan brothers to add a lunch counter to their saloon; a much needed improvement.4. Henry Arrard was granted a saloon license at Noxon March 4, 1908. On the second Thursday of November the newspaper reported him opening the Blue Front Saloon, but where he located is lost to history. Old timers say that saloons were on the flats near the river so Arrard's may have been there. James H. Corbett became postmaster at Noxon on March 5, 1908, according to the National Archives, but newspaper articles named Filo McNall as postmaster. Evidently McNall acquired the position with the store and hotel, an added task to store keeping, which was not an business to operate. All commodities were 'put up' by the clerk, and then written down. The chore of scooping such items as macaroni, beans, or rice from a barrel, or climbing a ladder to get kerosene lamps, harness, boxes of crackers, and other items stocked on high shelves fell to him. Patrons were not expected or allowed to select their own items. From hardware to kerosene, just about every conceivable kind of non-perishable merchandise available was stocked in the stores. Perishables such as milk, eggs, fresh vegetables, were gotten from local ranchers. Meat generally consisted of wild game or fish. 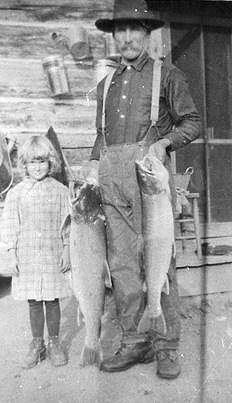 Everyone hunted and fished just as everyone cut wood to get the necessities need for living in the valley. 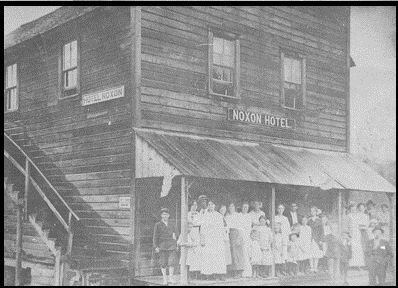 Beef was raised, butchered and brought from the Bull River country sometimes, but when Noxon stores added meat counters went unrecorded. "There was always plenty of fish in the river and creeks," Helen Berray said. "They were very good eating. There were firm fleshed whitefish, also, but they weren't too good eating but had a mild flavor. "In late August we fished Ross Creek that fed into Bull Lake. There we used different kinds of fly hooks. We used ten pound salt sacks, two together, one inside the other with a piece of rope to hang over the shoulder, or a piece of overall strap to carry them home. Before we put the fish in them we would either pick some green fern or thimbleberry leaves and put in the bottoms to keep the fish from packing so close and getting soft before we got home. "What we couldn't keep and eat right away I would make sardines of and can them, or can them with light mustard sauce. "The deer were always plentiful and often we even canned some of it. We used to trap bear and eat them and use the fat to cook with. Bear oil was also very good to use if you had any trouble with bad dandruff or certain sores on your head. "You shampooed your head good and put on bear oil but you really needed a cap of some kind at night to keep the oil off the pillow. It sure would help you to have nice hair. "There were lots of grouse and we had them to eat most all during haying season. We never ate too many wild rabbits, as there was never many. At Heron there were lots of big gray squirrels and my brother, Frank, used to kill them and dress them. Mother would roast or fry them. They sure were good." Merle Laramie, a homesteader on Bull River, began a deer farm and was known as "Napoleon" Laramie. With great patience the bachelor constructed a picket fence to contain the deer. He had goats on his place and sold meat. His cabin was of hand-hewed logs tightly chinked, snug and tidy with a tight cedar shake roof. During the summer months of 1908, R. J. Perry platted the town of Noxon on Northern Pacific railroad land "granted and dedicated to the use of the public forever", by the railroad. NPRR Depot at Noxon circa early 1900s. Courtesy Norman and Betty Larson collection. "when he wanted it right to the center of a pin head I got disgusted and I threw down the chain and quit. He was about eighty years old and was the crabbiest old man I ever knew," Weare said. "I think I explained to you some time ago that the company owns all of the land at Noxon and that there has never been any town site platted there. A number of people have put up their buildings on our right of way. To relieve the embarrassment (sic) of the situation you authorized me to have a small town site platted there. Such has been done, and the plat is enclosed herewith, for execution. I have made the town site about as small as it is possible to do so, as there is no likelihood that there will ever be a town of any size at Noxon." The town site recorded January 23, 1909 lay in Section 19, Township 26N, Range 33W and was notarized in Minnesota by W. F. Van Derlyn. The Noxon Hotel, owned by Mrs. Lena Baxter, was located at the west end of main streeet. Circa 1918. Courtesy William Finnigan collection. The General Merchandise Store to the east. ﻿Maynard's saloon on main street turned out to be about twelve feet further west than his lot, so timbers were hewed and placed under it. 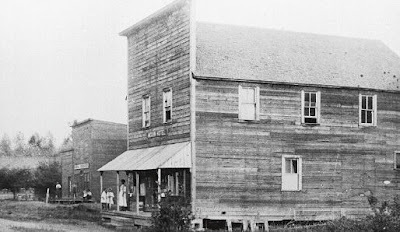 "Tom Moonen's hand stump puller was attached to the building and the saloon was moved so slow and careful that the guys inside played pool while it was being moved."5. A group watching a parade, from the veranda of the Noxon Hotel, circa 1916. Ruth and Pearl Maynard are the 2nd and 3rd ladies from the left in the back row. The building was torn down in the 1930s by 'Happy' Carner, who built his garage with the lumber he salvaged. Courtesy Stella Gordon Dameron collection. Corbett had sold out to the McNall brothers before George Huffman arrived and built a general merchandise store on the street running south at the end of the business district. The large glass front windows of his tidy frame building just below the base of the hill near the west end of town, faced east. Patrons could watch NPRR steamengines pulling eastbound and westbound trains puff into the station. Hoffman, a tall man of substantial girth who wore a black derby hat and a mustache, employed a team and wagon to move his cargo shipments from the railroad spur to his store. Caption: George Buck's General Merchandise Store, built in 1908. Circa 1910. Courtesy Clayton Bauer collection. Mr. and Mrs. Ura E. Ellis moved to Noxon from Kansas with their children, Della, Nettie, Pearl, Ura and William the summer of 1908. Ellis's acquired the Huffman store and gave a community dance in July to celebrate. Ellis's acquired the Huffman store and gave a community dance in July to celebrate. Mr. Wagoner is said to have had a store located on the north side of main street that preceded the one Huffman built. It was a big long frame building and sat right up against the railroad track. Wagoner often came into town with a team of oxen pulling his wagon. 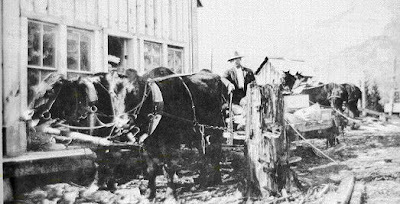 L. G. Wagner with his oxen team in Noxon, probably at his own building. Circa 1908. Courtesy William Ellis collection. The new 28-inch bell for the schoolhouse bell tower provided a reason for celebration in July 1908. It took several men to install the four hundred and fifty pound bell. Melodic peals rang on the cool night air, echoing throughout town and far into the surrounding canyons. One final crescendo heralded the dawn, as the departing merrymakers trekked homeward. It was another July night when two men entered the McNall store at the back door around l:30 a.m. They got into the dining room before McNall "put them to flight with guns."6. The next month, on a hot August afternoon a deputy U.S. Marshall boarded the eastbound train with Clifford Weare, James Finnigan and Zin Coza in tow, taking them to Helena to "answer to a complaint filed against them for running a saloon on the (Cabinet National Forest) reserve."*6. In September W. R. Hayes McNall Brothers store and ordered in a large stock of groceries. Filo remained postmaster. Fulks, unidentified, Mildred Weare, Ruby Fulks, Ruth Maynard, Hazel Lyons, Pearl Maynard, Charlie Knutson, Neil Weare, unidentified, unidentified. Front row standing left to right -- Blossom Johnson, Charles DeNoyer (or Mr. Baldwin), teacher; Madelein Brown, unidentified. Front row seated left to right -- Grace Gordon, Leonard Johnson, unidentified, Johnny Knutson, Solon Ellis. Middle row seated left to right -- Stella Gordon, Mammie Ellis, unidentified, Mable Fulks, Ed Lydie, Clayton Bauer, Billy Fulks, Beatrice Johnson, unidentified, Rhoda Knutson, unidentified, Ruth Knutson. Courtesy Stella Gordon Dameron collection. Ura E. Ellis became the postmaster December 2, 1908, succeeding Filo A. McNall. The post office shifted two blocks west, to Ellis' store. Sleighs and cutters made icy tracks through deep winter snow to their doorway, and people who needed to boarded their horses at a log barn east of Hays store, across from the NPRR water tank. No matter the season, or whether main street was snowcovered, deeply rutted mud or powdered dust, Ellis' kept their glass-paned front store windows gleaming. They proudly celebrated their daughter's marriage to George Buck. GEORGE BUCK GENL MERCHANTILE, painted in large letters, soon decorated the store on the side parallel to the railroad tracks. Fred W. Raynor was appointed constable of Smead Township on January 4, 1909 and on March 3rd, the commissioners appointed Ed Hampton Road Supervisor at Noxon. On May 10th, Ed Jackson and citizens of Noxon asked the commissioners to let road work by contract to the lowest bidder, but their request was denied. Grant Clark had a little sawmill up at the first forks on Pilgrim Creek. He sawed the lumber for a hotel he had built in Noxon on the bench just south and east of Finnigan's saloon. Jim Finnigan apparently was the carpenter on it. Clark named it Hotel Montana. Built about this time in the development of the little settlement, the exact year of its beginning is unknown. Grant Clark built this hotel on the hill. He sold it to Pauline Gordon, who added another wing. It was reported to be the best eating place in all of Sanders County while she operated it. Courtesy Stella Gordon Dameron collection. 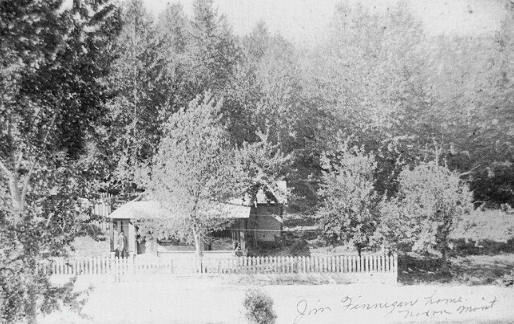 Arthur and Fanny Hampton's cabin and another small cabin occupied lots on main street east of the stores, saloons and Baxter's Hotel. Mrs. Saint Clair acquired Boomers Hall, on the bench of land behind the two small homes. She had it converted to Cottage Rooms. Since it overlooked the dusty main street roomers had a bird's-eye view of activity at the NPRR's water tower on the north side. Fanny planted an oak tree beside their cabin. The oak tree thrived, thanks to water bucketed from the water tower across the roadway. Cottonwood trees sprang up on railroad right-of-way land in Noxon. During two decades they grew tall on the rich, gravelly soil and sent leaf-covered limbs aloft to beautify the town. In springtime, eager children gathered morel mushrooms as fast as the crinkled succulents peeped through the deciduous-tree-leafmold surrounding the tree trunks. Sweetly aromatic sticky red coverings shed from bursting leafbuds coated shoesoles. Weeks before nature's spring crop of mushrooms ended, green-leafed canopies shimmered in the sun and shaded main street. When fall waned, the cottonwood's wind-rustled leaves fell to form thick, decaying mats, and forewarned settlers that snowfall might be expected anytime. 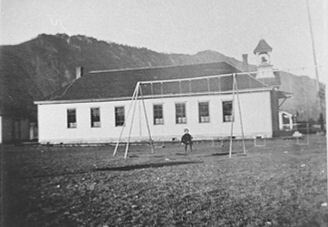 Noxon's 1st schoolhouse after first addition was added. Cleo Gore is the child in the swing. Courtesy Ed and Carrie Gore collection. 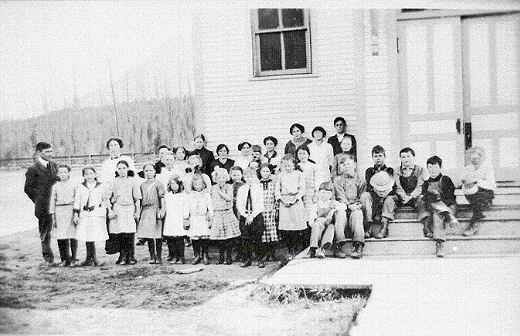 Students and teachers, circa after the addition to original Noxon schoolhouse. Courtesy William Ellis collection. Sanders County Independent Ledger, June 7, 1907, and Sanders county court records. Sanders County Independent Ledger, January, 1908. Don Maynard oral tape-recorded history. Sanders County commissioner's record: School was convened on September 4, 1906 at Noxon for the first time after Sanders County was formed. Miss Nina E. Clawson taught the term that closed April 26, 1907. Census for Noxon area listed 37 children between the ages of 1-18. The pupils in the spring of 1907 were Ellis Anderson, Melvin Anderson, Madeline Brown, Vic Anderson, Cora Brown, Elizabeth Evans, Amelia Evans, Fern Fulks, Ruby Fulks, Mary Hampton, Lillian Raynor, Arthur Raynor, Neil Weare, Ruby Engle, Charles Knutson, Florence Whitford, Alexander Dun, James Riley, Goldie Fulks, George Hampton, Ernest Raynor, Edward Raynor, Mildred Weare, Alma Engle, John Knutson, Pearl Whitford, Letta Whitford, Mary Haugen and Lewis Bridget. The school board was composed of J. E. Knott, Chairman, S. S. Brown, Clerk, and Mr. Van Dyke and William Beebe. It was still District No. 3. Records at the courthouse show that when school resumed the fall of 1907 Charles Wiggins was the teacher and District No. 10 had been formed. Mr. Wiggins was teacher again in 1908. Ed Hampton was the first Clerk for School District No. 10. The first trustees were all three appointed on Sept. 12, 1907, which must be the date of annexation from District No. 3. Miss Josephine Bunn and Mr. Jim Saint taught classes there. Mr. Kurr, Mr. Styler, and Mr. Moran were the next teachers, respectively. Little seems to be known about them with the exception of Mr. Moran, who is reputed to have had the habit of throwing erasers at his pupils. The voting registration boundary was changed to make Noxon Precinct No. 5. West of Tuscor to Smead Spur on the NP Railroad. Heron became Precinct No. 6 to the Idaho border.